Medica Institute of Neurological Diseases (MIND) of Kolkata organizes 5th Functional Neurosurgery Workshop in Kolkata like they are doing for last four years. In this year the Functional Neurosurgery Workshop will have PGNMG & EUROPAR Meeting as well. 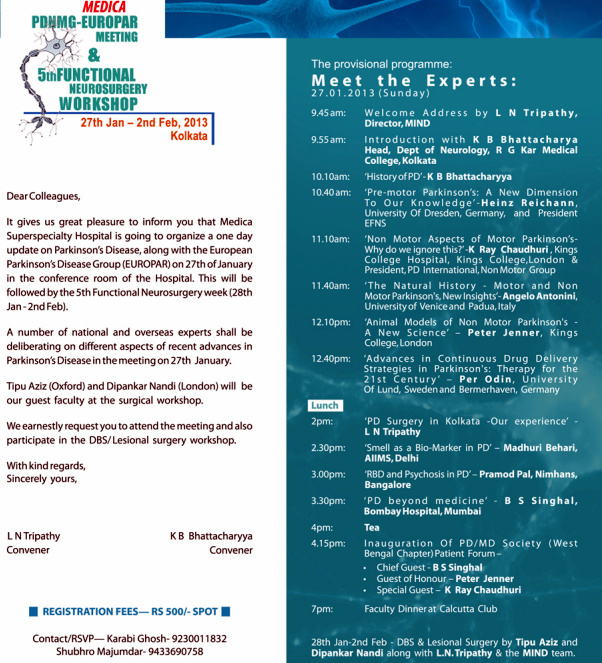 The 5th Functional Neurosurgery Workshop of Kolkata organized by Medica Institute of Neurological Diseases (MIND) will start on 27th January 2013 at Medica Superspecialty Hospital, Kolkata [Address & Contact details mentioned below]. During this 7-day long workshop PDNMG & EUROPAR Meeting will take place along with Live surgery for Tremor, Dystonia & similar movement disorders. Renowned doctors will felicitate the 5th Functional Neurosurgery Workshop of Kolkata and Dr. L.N. Tripathy [Senior Consultant Neurosurgeon & Spine Surgeon – Director of MIND, Vice Chairman of Medica Superspecialty Hospital], Professor Tipu Aziz [Professor & Head of Functional Neurosurgery Unit at John Radcliffe Hospital, Oxford (England)], Dr. Dipankar Nandi [Consultant Neurosurgeon – Charing Cross Hospital & Reader – Imperial College Healthcare NHS Trust] are to name a few. The Neurosurgery Workshop organized by Medica Institute of Neurological Diseases (MIND) of Kolkata will end on 2nd February 2013. A Registration Fee of Rs.500/- is required for participating. For further details please call 9433690758 phone number or contact at Medica Superspecialty Hospital Kolkata [Address: 127 Mukundapur, E.M. Bypass, Kolkata-99] or simply visit www.medicahospitals.in website. Certificate in Pharmacovigilance in Clinical Research admission 2013 Jadavpur University (JU) eligibility criteria qualification requirement 2013 admission Jadavpur University (JU) Certificate in Pharmacovigilance in Clinical Research application form download online apply process date schedule Certificate in Pharmacovigilance in Clinical Research admission 2013 Jadavpur University (JU) address phone contact number details. Applications are invited from the interested eligible candidates for the admission to Certificate in Pharmacovigilance in Clinical Research at Jadavpur University (JU) in the academic session starting from 2013. Let’s check the details information about Certificate in Pharmacovigilance in Clinical Research admission 2013 below. • 2013 Admission at Jadavpur University (JU) in the following Course(s): - Jadavpur University, Clinical Research Centre (CRC) in collaboration with Medica Superspecialty Hospital, Kolkata announced Certificate course in ‘Pharmacovigilance in Clinical Research’, which is a 9 month course. • Eligibility Criteria for Certificate in Pharmacovigilance in Clinical Research Admission at Jadavpur University (JU): - B.Pharm, B.Pharm (Ayurvedic), M.Pharm, M.Pharm (Ayurvedic), MBBS, MD, BDS, MDS, Nursing, BHMS, B.V.Sc, Diploma in Paramedical courses, B.Sc with Life Science – candidates having any one degree among these mentioned are eligible to apply for Certificate in Pharmacovigilance in Clinical Research admission. Phone Contact Number of Jadavpur University (JU): - 033-24146666 [extension: 2058]. • Jadavpur University (JU) Certificate in Pharmacovigilance in Clinical Research Admission 2013 Application Procedure: - Application Forms are available at Information Centre, Jadavpur University, Kolkata campus from now on. The Last Date for Submission of Application is 10th January 2013 and the Admission will happen on 20th January 2013. All important classes of Certificate in Pharmacovigilance in Clinical Research will commence on & from 2nd February 2013. For Certificate in Pharmacovigilance in Clinical Research Admission 2013 in Jadavpur University (JU) interested candidates are requested to apply within the scheduled dates for 2013 Certificate in Pharmacovigilance in Clinical Research admission in Jadavpur University (JU). Medica 4th Functional Neurosurgery Workshop at Kolkata is going to be organized at Medica Institute of Neurological Diseases (MIND) on 3rd July 2012. Let’s check out the details on Medica 4th Functional Neurosurgery Workshop which is going to happen at Kolkata. • Medica 4th Functional Neurosurgery Workshop Kolkata 2012 Date Schedule: - 3rd July 2012. • Medica 4th Functional Neurosurgery Workshop Kolkata 2012 Venue & Location address: - Medica Institute of Neurological Diseases, Medica Superspecialty Hospital, 127 Mukundapur, E.M. Bypass, Kolkata [Phone number: 9433690758]. • Medica 4th Functional Neurosurgery Workshop Kolkata 2012 Organizer details: - Medical Institute of Neurological Diseases (MIND) Kolkata. • Details of Medica 4th Functional Neurosurgery Workshop Kolkata 2012: - Medica Institute of Neurological Diseases organizes Medica 4th Functional Neurosurgery Workshop on 3rd July 2012 at Kolkata where Live Surgery for Tremor, Dystonia & Similar Movement Disorders will be shown & discussed by eminent Doctors like Dr. L.N. Tripathy [Senior Consultant Neurosurgeon], Professor Tipu Aziz [Professor & Head of Functional Neurosurgery] and Dr. Dipankar Nandi [Consultant Neurosurgeon]. Search Tags: Medica 4th Functional Neurosurgery Workshop venue location details, Medica 4th Functional Neurosurgery Workshop Kolkata starting ending dates schedule timings, Medica 4th Functional Neurosurgery Workshop Kolkata features facilities details, Medica 4th Functional Neurosurgery Workshop Kolkata exhibition entry timings ticket charge Medica 4th Functional Neurosurgery Workshop Kolkata 2012. Medica Superspecialty Hospital Mukundapur Kolkata is one of the best hospitals that have best care, best ambience & best technology. Medica Superspecialty Hospital Mukundapur, Kolkata has been established as the place with every treatment in Kolkata at affordable price for all. There is no need to take a patient from here to there; because everything under one roof at Medica Superspecialty Hospital Mukundapur, Kolkata. Medica Hospital Kolkata provides state-of-the-art facilities in Cardiology & Cardiac Surgery, Neurology & Neurosurgery, Orthopedics, Joints & Spine Treatment, Liver & Gastroenterology, Dialysis facility, advanced Urology services, 24-hour ambulance service and other common facilities. Other than Medica Superspecialty Hospital, It also provides quality education & research facility to the aspiring doctors at the Medica Institute of Cardiac Sciences, Medica Institute of Neurological Diseases (MIND), Medica Institute of Gastroenterology & G I Surgery, Medica Institute of Orthopedic Sciences, Medica Institute of Critical Care and Medica Institute of Kidney Diseases at Mukundapur Kolkata. Whether it’s a disease of brain or bones or ENT; every sort of treatment is available at Medica Superspecialty Hospital Mukundapur, Kolkata. • Address / Location of Medica Superspecialty Hospital Kolkata: - 127, Mukundapur, E.M. Bypass, Kolkata-99. • Phone contact number of Medica Superspecialty Hospital Mukundapur, Kolkata: - 033-66520000. You could check Treatment Cost packages of Medica Superspecialty Hospital Mukundapur, Kolkata online at www.medicahospitals.in and you may write your queries to contactus@medicahospitals.in as well. Medica Group has established smaller hospitals in Siliguri (North Bengal), Asansol (Burdwan) and at North-Eastern States of India; but Medica Superspecialty Hospital Mukundapur, Kolkata will serve as the hub of all Medica Hospitals.